Julia Jarcho’s new play Dreamless Land is, in fact, all a dream. The action starts when a young woman, Haley, enters the performance space clutching a teddy bear to her chest. Around the stage sit three people: an older man, an older woman, and a young man. She nods to them in turn, and they beep like off-duty automatons from The Stepford Wives or Blade Runner. The young man seems to resist her, so she nods at him forcefully once more. He beeps again, takes a propeller beany out of the wooden box on which he sits, and puts it on his head. Haley takes a seat upstage and watches as the three perform a family drama whose theme is fracture, dislocation, and fear. Father appears to be an alcoholic abuser. Mother is emotionally distant. 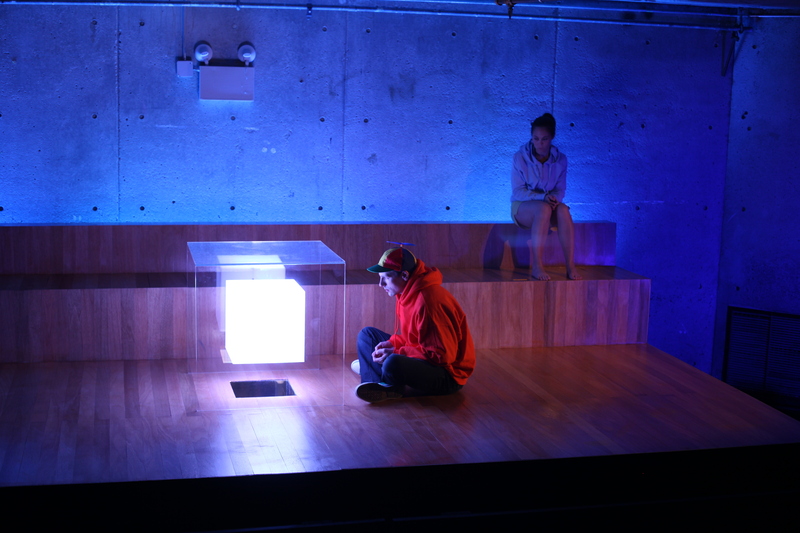 And Morton, their son, escapes into technology, nebulously defined as a glowing, translucent cube inside a larger transparent plexiglass cube that sits in the center of the stage. Fracture, dislocation, and fear define every aspect of this dystopian American nightmare. The action appears to be focused through Haley’s perception of events. From her perspective Carver, the father, and Joyce, the mother, and – perhaps most importantly – Morton are dreamlike caricatures, American mytho-types. As such they are both iconic and inscrutable. In one telling scene Haley and Morton are playing Guitar Hero (Morton on guitar, Haley on bass). While playing the game, Haley tries to ask Morton about his upcoming trip to Las Vegas to meet Carver. She wants to discover the “truth” about the two of them, but Morton resolutely asserts technology as a substitute for feelings. This is a familiar trope of modernism/post-modernism, but unlike the “popular” version of this technique that you might find in horror movies, Haley herself is dislocated as the narrative center of the play. She is not so invested with making sense of the truth that a human sense of dread (or plot dénouement) ever materializes. She breaks the fourth wall without warning halfway through to tell us that she is now twenty-five. Joyce is now her boss, Carver, still a homicidal misogynist, has joined the 1%, and Morton has morphed into Martin, but the essential dynamic between them is the same. The terrible truth is that Haley is also an automaton, the placeholder for a narrative convention. Ms. Jarcho, who studies theatrical Modernism at the University of California, Berkeley’s department of Rhetoric, is a master of this mode of theater. She has clearly learned the lessons of Ionesco, Genet, and Becket. She has also developed an ear for particularly American cadences of absurdity resonant with Mamet and noir. The architecture of halting, disjointed speech not only supports the play but is its fabric. In contrast to narrative playmaking, where the plot is the skeleton and language is the skin, Dreamless Land studies the way language brings into being the typical (and typically dysfunctional) scenes, social tableaux, and logical, temporal unfolding of lived experience. Consequently, though there are gaps of meaning and perception between the characters, taken as a whole the play is a finely grained and highly polished surface with no hint of interior depth. Like Dalí’s paintings, the unconscious is the subject, but not itself manifest in the work of art. Don’t take that as a diss, however; I prefer a thoroughly polished play to reckless sloppiness any day. In addition to its airtight script, the sound and stage design contribute mightily to the highly professional execution of Dreamless Land. In fact, they are as integral as the words and gestures of the actors. And the actors – Linda Mancini, Jenny Seastone Stern, Richard Toth, and Ben Williams – deliver their roles flawlessly. Ms. Jarcho surely deserves an outsized share of credit for the success of all the moving parts of this production because she is not only the writer, she’s also the director. The vision that takes shape on the stage is utterly integrated and focused through its creator’s imagination. Ultimately, Dreamless Land is a must-see for anyone who enjoys the method and craftsmanship of Modernist theater – and for anyone who enjoys peering into the fractured mirror of modern life.